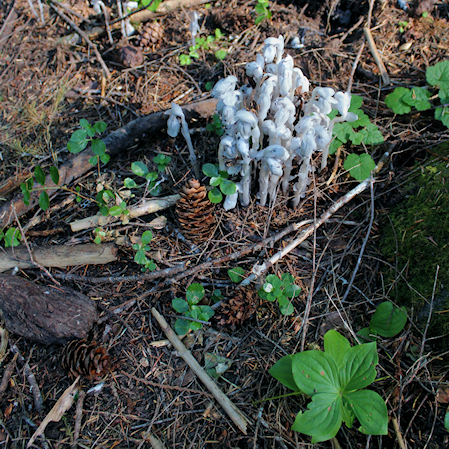 On a recent hike along Pamilia Creek, I came across this clump of Indian Pipe grow­ing under a dense stand of large Dou­glas fir. It caught my eye, because even though it’s a herba­ceous plant, it looks more like a fungus. In fact, I always assumed Indian Pipe, like many fungi, lived off of the decom­pos­ing leaf lit­ter of the for­est floor. After all, it doesn’t have chloro­phyll and can’t man­u­fac­ture its own food. But I was wrong. Again. Today sci­en­tists know that there aren’t any plants capa­ble of directly break­ing down of organic mat­ter. None. If Indian Pipe can’t make its own food because it doesn’t have chloro­phyll, and it can’t use the decom­pos­ing leaf lit­ter, how’s it survive? In order to get food, the roots of Indian Pipe spe­cial­izes in a form of par­a­sitism known to sci­en­tists as myco-heterotrophy. And here’s how it works. Indian Pipe takes nutri­ents from the roots of a tree, but not directly. It actu­ally has its roots tap into and take nutri­ents from a fun­gus asso­ci­ated with the tree’s roots. But in order for that to make any sense, you have to under­stand the rela­tion­ship between the fun­gus and the tree. You see, the fun­gus and tree have a mutu­ally ben­e­fi­cial thing going on. The fun­gus is all these tiny, thin threads like micro­scopic roots, which are known as mycel­lia. The mycel­lia are much smaller than even the finest roots of the tree. And they tap directly into the tree’s roots. Which the tree is very cool with, because the mycel­lia are like exten­sion cords for the roots. They get into a way larger vol­ume of soil that the tree ever could on its own. The mycel­lia pass some of the water and min­eral nutri­ents they absorbed from the soil to the tree. In exchange, the fun­gus gets car­bo­hy­drates from the tree. Each organ­ism helps the other out in this sym­bi­otic relationship. Many fungi and trees have this type of rela­tion­ship — called a myc­or­rhizal rela­tion­ship. Indian Pipe is a free­loader. It doesn’t give any­thing back to the fun­gus or the tree. It takes min­eral nutri­ents from the fun­gus that the fun­gus had got­ten for itself, and it also takes car­bo­hy­drates that the fun­gus gets from the tree. It’s a direct par­a­site of the fun­gus and an indi­rect par­a­site of the tree. That’s the fairly unusual form of par­a­sitism known as myco-heterotrophy. I am always amazed at what I can learn from a sim­ple walk through the woods. Like how many of the links between plants, the soil, and water are hid­den from my casual obser­va­tion. Truth be told, I didn’t know that Indian Pipe was a par­a­site until I looked into it for this post. I won­der what else I think is so, but isn’t.